The CPCU® 556 exam questions are tough; these questions will focus on the minor details of each topic. The CPCU® 556 exam consists of 85 multiple choice questions broken up into two sections, part A and part B. Part A: Concept questions – The first section of the exam will be concept questions; these questions will test your understanding of a definition or topic. The multiple-choice answers will generally provide 2 or 3 partially correct answers and one “best” answer. Part B: Case questions – The second section of the exam will be case questions; these questions will require you to apply your knowledge to a specific scenario or event. You will be given a real-life scenario; your job will be to select the best recommendation to solve the given scenario. Tracy is 35 years old and would like to contribute to an investment account to help her fund retirement. Tracy plans to invest in this account for the rest of her life, even during retirement. Tracy would also prefer an account that does not regulate her distributions. What type of retirement account should you recommend to Tracy? The answer in this case is C because the Roth IRA does not have any required minimum distribution restrictions and investments can be made at any age, meaning Tracy can continue to invest in this account during her retirement. The best way to approach this type of concept question is to start by first understanding what the individual in the scenario (in this case Tracy) is asking for. In this example, Tracy is asking for a retirement funding vehicle which she can invest in for life (no age eligibility restrictions) and does not put any restrictions on the time or amount of her retirement distribution (no RMDs). The second step to approaching this type of question is to analyze the given multiple-choice answers to see which option best meets Tracy’s requests. From your studying, you know that Tracy cannot invest in a traditional IRA after age 70.5 and required minimum distributions must be made after age 70.5. You also know that 401K plans are employer sponsored and have a required minimum distribution after retirement or after the account holder becomes 70.5 years old. Lastly, you know that annuities have distribution age restriction at age 59.5 and 70.5. This leaves you with the Roth IRA, which meets all of Tracy’s requirements, with no required minimum distributions and no eligibility restrictions based on age. For more concept questions, check out our free CPCU® 556 practice exam. As we discussed in our CPCU® 556 Exam Format Blog, retirement funding and income taxation are important topics. This gives you an example of how tricky these questions can be. You will be given a scenario like the one seen above; it is your job to understand what is being asked of you and how to solve or recommend a solution to the scenario. In this example you are given a lot of information. You must decipher what the question is asking and determine what facts are relevant to answering the question. In this case you must know “what is retirement income shortfall”, “how is the value of retirement income shortfall fund is calculated” and “what is required to determine the present value $1 annuity factor”. In this case the answer is B. The value of the retirement income shortfall fund is calculated by multiplying the present value $1 annuity factor (16.247) by the retirement income shortfall at retirement ($80,000). The present value $1 annuity factor is determined by using the number of years of retirement (25) and after-tax return during retirement (4%). The best way to approach the CPCU® 556 case exam questions is by first determining what facts in the given scenario are necessary to determine your answer. In this case, you know that to calculate the value of a retirement income shortfall fund, you need the retirement income shortfall at retirement, length of time of retirement and annual after-tax return during retirement. The rest of the information, such as Nathan’s age, year of retirement and investment return before retirement are all there to confuse you. The second step is to determine which answer is best. In this case, the answer is pretty straight forward if you know how to calculate the value of the retirement income shortfall fund. In some cases, you will be required to select the best answer for a given scenario (as you saw in the concept question example) it will be your job to determine which of the 3 or 4 partially correct answers is best suited to resolve the given scenario. For more scenario based questions, download our free CPCU® 556 practice exam. Ready to get started studying? We’re here to help (for free). 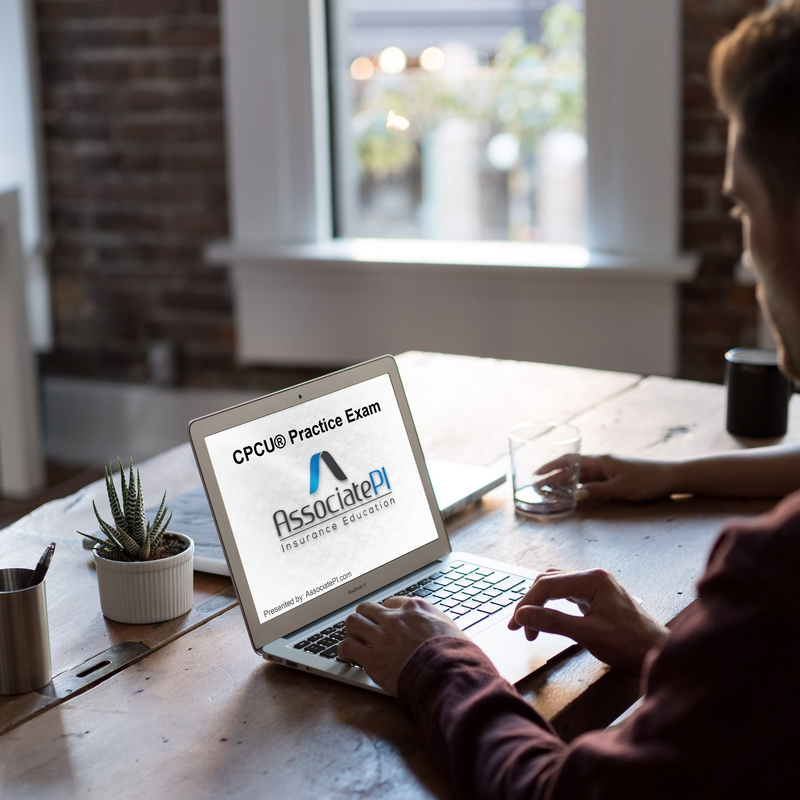 Download our free CPCU® 556 practice exams to get a feel for the type of questions you will see on the exam. 5 responses on "CPCU® 556 Exam Questions: How to approach and conquer your CPCU® 556 exam"